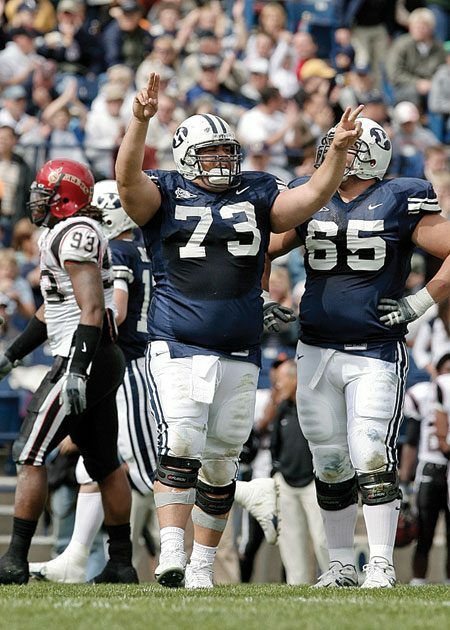 A major force on BYU’s offensive line, Jake Kuresa went on to play arena football for the Utah Blaze. As a senior at Mountain Crest High School in Hyrum, Utah, Kuresa led the school to a state championship. He twice earned all-state first-team honors, was a Rivals.com top-100 prospect, and received PrepStar magazine all-America honors. His accomplishments, work ethic, and athleticism did not go unnoticed. More than 50 schools recruited Kuresa, including USC, Washington, Nebraska, and Notre Dame. He decided to attend BYU. He red-shirted the first year then started all 12 games as a freshman in 2003, seeing action at both guard and tackle. By the time he was a junior he was recognized as “best pass blocker” by Lindy’s Football Annuals and was named one of the nation’s top offensive tackles by Phil Steele’s College Football Preview. The two-time All–Mountain West Conference performer caught the attention of the New Orleans Saints. He was eventually waived by the Saints, but the Utah Blaze arena football league team picked him up, and in 2008 he played offensive line in the arena that hosts the Utah Jazz during basketball season. In arena football, Kuresa had to adjust to a shorter field (50 yards instead of 100) and higher scores (often in the 60s and 70s). But it’s still a sport he loves. “What a great way to support my family—I play football,” he says.